..really, I think I've finally unwrapped it - explained it. What a curious journey. Long Sea Bass Trip: Tuesday November 4th - $125.00 - 6AM to 4PM.. Very Light Rail For A Regular Trip Friday, October 31st. Weather Looks To Be A Classic "Calm Before The Storm." 10,603 Reef Blocks by the rail – 3,000 at Jimmy Jackson's – 2,136 at Doug Ake's – 1,135 at Saint Ann's – 558 at Eagle Scout Reef - 537 at Lindsey's Isle of Wight Reef and, just begun, 72 at the Brian Sauerzopf Memorial Reef..
High hook had 12 sea bass Saturday. Everyone received a partial credit for another trip even after 9 hours. It was all I could do to stay in the ocean. Sunday's trip was cancelled for high winds. Drama subsiding, we came in 2 hours early on Monday's long trip with a boat-limit of sea bass. We absolutely, positively, could not have taken one more fish. Had a couple over 4 pounds; triggers & blues too - nice. Extra nice because cbass were taking a jig..
Look forward to Friday's "calm before the storm." Not looking forward to weather's wrath late Saturday & Sunday..
Saturday Might Play - Maybe - Very Iffy. Monday probably. Tuesday, November 4th, I'm going long again in what looks to be another calm. All told, not a stellar October. There's always that risk in fishing. Weather Happens. Now weather has a new compadre - Regulation. Lost most of October to regulation, more still to weather. Fisheries management & fishery restoration's foundational concept stems from the belief we can remove fish, both commercially & recreationally, while allowing a population to expand. We do that with "Surplus Production." Take some, leave the rest. We've seen it work many times now. If the number of fish becoming legal to the fishery, (aka "recruitment" in fisheries science circles;) if recruitment is the gross or total production number from which a much-lower surplus production number is determined and harvested from--a crucial bit of information determining what Quota shall be: why then are we not preoccupied with discovering methods by which we might increase production? I do see river & estuary restoration works in progress that may well increase fishery production in those regions & for those fisheries. I do not see any effort whatever to even gain knowledge of lost marine habitat, nor understand habitat's role in production. A widely held belief in fisheries is that science cannot determine future production by the number of fertilized eggs - there are simply too many variables in their survival. It's often been seen where fewer eggs in optimal conditions result in a great year class; while mad-spawning with, say, a poorly timed influx of fresh water, results in low production. There are many cases for many species well-evidenced in the literature. However, in black sea bass we see science's illumination from other species casting only a convenient bit of light. Science here is used fable-like, as a tale that teaches a lesson, a parable: It's a misuse of science. I believe delving deeper, getting beneath the "Recreational Catch Is Difficult To Predict" mantra sourced from catch estimates scribbling unpredictable numbers every-which way on a graph. I believe, unglued from bad estimates, science does show how lots of sea bass eggs, fertilized by lots of small males, did create exponential population growth in sea bass fifteen and more years ago. I've had the curious life experience of seeing our region's black sea bass population shoot straight up from what I'm certain was rock-bottom, their lowest point in history. They went from there to what I firmly believe was habitat capacity - we couldn't have held many more sea bass in our region in 2003. This population explosion occurred in a period when habitat was actually increasing. During the mid/late 1990s I was actually seeing areas I'd already fished for years expand - natural reef grew larger. Although by accident, we were witnessing habitat expansion. I'd only seen wrecks get smaller as they aged; couldn't conceive of habitat growing larger. No one had any idea what habitat was down there. After kicking around a few ideas with interested scientists, ideas like grab sampling with PONAR dredges; in 2001 I dropped a camera to the seafloor. Wow. Sea whip is amazing fish habitat. I call our primary natural habitat "whip meadows." At about 2 1/2 feet tall, these almost spongelike stalks of orange soft-coral (a gorgonian I'm told) wave about in ocean currents not unlike our "amber waves of grain." In our region the biggest area of whip meadows is the Old Grounds. I'm positive these sea whip colonies form Essential Fish Habitat (EFH) as defined in Magnuson. The US National Oceanic and Atmospheric Administration (NOAA) had no interest then & has no interest now. Actually, there are a lot of scientists who would love to have a look, there's just no funding. I don't really know who is at fault. It's always someone else's job - even ours. We fishers, and especially rec fishers with our vast numbers of participants who are wholly unaffected economically by regulation and therefore far less likely to participate in correspondence with regulators; we, collectively, have not told Congress to tell NOAA we want discovery & repair of marine habitat. Our non-profit representation has to deal with the numerous regulatory fires that pop up, especially where important fish are concerned. They haven't got time for habitat that may or may not exist where unimportant fish live. Commercial representation actively seeks to keep these pesky reef bottoms away from management's view. Closed areas are universally despised.. I see it thusly: Regulators are the many contractors at an enormous job site. Their work is dictated by scientists who only have time for what's on a computer screen. Because estimates are there, though fluctuate wildly beyond any realistic scope; the reconstruction & restoration work sails wildly off track. The architects for this job have no idea what the habitat looked like that was foundational in support of once far-larger reef-fish populations. They pick individual species and focus restoration efforts on them. As their newly rebuilt populations gain too much size, they topple..
For fishery restoration to work we must have habitat considerations - a far grander plan - Much Better Blueprints. Not just physical structures, but biotic elements as well; the water quality and forage species we often see - but remain unconnected to fisheries restoration. During the period of early sea bass management we were size-limit protecting the entire spawning stock - on purpose. That was regulation's intent as it was explained to me at that time. I had already been doing it for 5 years; had been throwing back 9 inch cbass to give them a chance to spawn. I knew management was going to accelerate populations madly because just our efforts at self-regulation were causing obvious increases in local sea bass populations. Habitat expansion on natural rocky bottoms along with new artificial reef, plus spawning population expansion by size-limit protection; together these great biological forces created exponential stock growth despite increasing fishing pressure. Before management began our sea bass fishing was really good some of the year. Sea bass fishing became the best anyone could remember - year round - during early management. Now it's OK some of the year again. To unpack that bell-curve completely would require a book. Here I'm hopeful readers will be familiar with my thoughts on spikes in the MuRFSS/MRIP recreational catch estimates; here I hope readers understand how regulators reaction to estimates of catch that could not possibly be true have taken sea bass restriction to far higher levels than was ever necessary. For instance: In 1998, the second year of federal regulation for sea bass, our size limit went up 1 inch for a 10 inch size limit because of 1997 catch estimates. There was also a late-summer closure owing to an increase of 1,220,000 fish estimated in New Jersey's 1997 For-Hire landings. The 1.2 million increase took the New Jersey For-Hire estimate to 3,100,000 sea bass. No other state or mode varied from previous years by a noticeable amount. This estimate is, of course, junk. Of New Jersey's 3,353,000 sea bass in 1997, only 263,000 were thought to have been caught by Private Boats. In 2009 NOAA became so alarmed by recreational overfishing that they closed sea bass by emergency regulation. (and I had to empty all savings accounts to refund advanced sales..) We were thought to have caught, in 2009's total coastal estimate, 1,781,000 sea bass - just a little more than New Jersey Party/Charter had been accused of going over in 1997. Of those 2009 Cape Hatteras to Maine sea bass, 420,000 were thought caught by For-Hire; the other 1,361,000 were thought caught by private boats. We screamed about the For-Hire estimates in the late 1990s. We were counting our fish and knew the estimates were absolutely full of baloney. In 2003 our For-Hire data entry was changed permanently. Funny: 2004 is the first year Private Boats ever catch more sea bass than For-Hire skippers.. Since then Private Boat sea bass estimates have been climbing, For Hire dropping. If the 1997 NJ estimate were at all true, just that state's Party/Charter fleet would have not caught 28,000,000 sea bass over the last decade. That number gets a lot higher if you consider all players - even commercial - who struggle with tighter & tighter regulation. But for that saving of fish to accrue; If 'saving' sea bass by regulation is to have any benefit at all; If some 'surplus production' is going to get squirreled away and used to create an enormous spawning machine (driving catches just 1/10 of what we had before any regulation existed at all? ): For Surplus Production To Be Useful Would Require Overall Production To At Least Remain Stable. Sea Bass production has dropped like a stone throughout the Mid-Atlantic. Fisheries theory would have production varying year to year, but increasing over time. I believe our factual decline in production is because on many nearshore reefs/wrecks/artificial reefs the vast spawning populations of 15 to 20 years ago--which even filled every one of thousands of patches of whip meadow in the Old Grounds; I believe many of those places, those tiny isolated spawning sites that may well have had under a dozen bull males but still contributed magnificently to total production: Those places now offer zero production. There's no surplus to safely remove because there's no nearshore production occurring. This same effect can be created on the largest pieces of habitat nearest to shore, reefs & wrecks that have historically been over-pressured because they are convieient to the half-day party boat fleet. Because sea bass start as female and then switch to male as needed to fulfill a given reef population's need; and because we open fishing season so near to the beginning of spawning; and especially because size limit regulation does not trigger spawning participation until age three; those fish recently switched to bull are swiftly caught off. They're more aggressive so they get caught. Because our present day size limit insures an unending supply of the same sized fish to begin sexual transition to take the place of now-absent males: younger sea bass still percieve no impetus to begin spawning - there's too many big guys. That's why size limit regulation alone, with no recreational overfishing at all as claimed by statistic, has caused a population decline in the central & southern Mid-Atlantic since 2002. Where management once effected exponential population growth in the late 1990s, there now exists a steady decline despite increasingly harsh regulation. Where in the heck are those 28,000,000 sea bass New Jersey didn't catch in the last decade? When management began all regulators were shown, if they read their hand-outs, that every sea bass had spawned by 9 inches - some twice. That means we protected the ENTIRE SPAWNING CLASS for at least a year when regulation began. That's what we observed at sea too. Hundreds, if not thousands of small, undersized males DAILY. In todays fishery I can usually count the number of mature male sea bass we see under nine inches, literally, on one hand..
"Well," scientists say, "they're too small & too inexperienced then to be effective spawners." Uh Hu. The reason actual 'catch per unit of effort' - not catch estimates, but real CPUE - the reason catch climbed straight up in early management was because there were suddenly a lot more fish. Protecting the entire spawning class worked. Since 2003 our sea bass spawning stock has been comprised not of one year olds (9 inch) as in early management, but of three & four year olds (11.5 to 14 inches). Because size limits have steadily risen in accord with MuRFSS estimates; sea bass look around their reef habitat today and no biologically driven need to spawn at age one. Used to be they all did. It could be pheromones--chemical scents that trigger spawning's urge, are delayed. It could be brute nature. A small sea bass trying to spawn may get his eyes poked out in bull behavior. When these three year old "inexperienced spawners" of today finally begin to spawn is also when they recruit to the recreational fishery. We Can Keep Them. This New Spawning Population Is What We Take Home To Eat. That's if commercial fishers haven't caught them first. Their size limit is 11 inches, ours is 12.5..
No matter how ebullient their youthful urge, spawning is somewhat curtailed in hot oil. In the fall of 2003 I wrote how uneven commercial pressure--just bycatch in our region's heavy winter trawl summer flounder fishery--could, because of habitat fidelity, create dramatically imbalanced fishing pressure on a single region's sea bass population. A few months later we had an enormous bycatch event. In the spring of 2004 our recreational catch was torn in half. I then theorized that population density was what controlled age at maturity and thought sea bass would swiftly regress to a younger spawning age. Those younger sea bass, however, have never rejoined the spawning stock. Size limit regulation has kept the number of sea bass spawning at a minimum on our most populated reefs and to nearly zero on our tiniest reefs. Spawning activity is therefore almost zero nearshore. Early management's BEST production occurred where fishing pressure was heaviest. Out past 12 miles reefs swiftly filled with surplus production - those fish grew large. Inside of 12 miles every sea bass was a spawner. Production Surged. Inside 12 miles now is a comparative ghost town. . .
We have always had management assuming MuRFSS/MRIP's wild assertions of catch should be followed blindly in creating recreational regulation. Now we have this grand notion that climate change has shifted entire populations of fish; that sea bass & especially flounder have moved north. In the case of sea bass I hope I've made it plain that New England's now somewhat warmer waters ought to be a boon, an absolute windfall to managers as they pound their chest, "Look what we did! Here's a mammoth sea bass population! The Greatest Restoration Of All Time!" Instead: lower & lower quotas are being set because overall population indices are dropping despite New England's swelling sea bass stock. Despite New England's recent rise, our numbers are pulling overall abundance down. As MRIP creates a new cocktail of Timothy Leary approved statistics every two months, science then tells management what they have to do to arrest recreational overfishing. And our troubles grow worse. . .
Science has not examined the seafloor to see if our reef fish live on reefs. Science has not examined shifting age at maturity for its potential as a powerful tool in stock restoration. Management looks at all these numbers in coast-wide collection. They do not see unique regional effects of regulation. They hear scientists claim, "Sea bass are moving north" and equate that to: "nutin we can do bout that." It is true that sea bass are expanding north in warmer water. But because it is very much true that sea bass are also increasing in population along Florida's Gulf Coast, scientists cannot substantiate management's assumption 'sea bass are moving north' is necessarily accompanied by the Mid-Atlantic's southern population vacating the premises. But it's "Cool" science; plausible assumptions are left to fester unproven. Sea bass are expanding north - True. There is no 'warming' reason, however, for them to be in decline in the Mid-Atlantic's still quite temperate waters. That there is a very noticeable decline in population is no fault of climate. 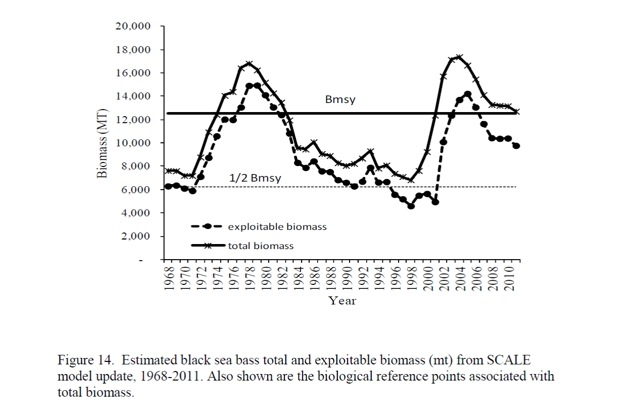 Using the work shown below from our top sea bass scientist; a work derived only in very small part by recreational catch estimate, we can see there were approximately 12,500 metric tons of sea bass living along the Mid-Atlantic in 2001. Back then quite nearly all of those sea bass, every one that had left an estuary, would have been actively spawning. In 2002 & 2003 we were not seeing as many smalls coming offshore as we had in recent years, but we were catching jumbos like crazy. I personally caught limits of fish with no bait, just bare hooks. Clients would sometimes catch a limit with just rubber grubs; this was long before "Gulp!" had been invented.. Using Dr. Shepherd's graph I estimate our spawning stock today to be about 2,000 MT. We went from all sea bass in the ocean spawning, to just the largest few - and they're legal to catch. I think the left-hand peak represents LORAN C's invention and wide-spread acceptance. As more and more boats found more & more sea bass reefs & wrecks with utter electronic reliability, those fish were caught off. Very importantly, LORAN also allowed various towed gears to get much closer to wrecks and rocks. This is the exact period when men who fished the era described habitat loss in grand scale. Were we to have a graph showing sea bass landings back to the 1950s there would be a spike many times greater than shown for 1977 or 2003. As WWII surplus became available & its servicemen became in need of new work, the trawl fisheries shoot skyward. Because it remains that there were more sea bass caught and sold by weight in the 1950s than in all decades since combined, I believe Dr. Shepherd's graph above ignores the first habitat decline post WWII. The graph only shows the second great habitat decline - but most permanent. A lot of our "hardbottom" where natural reef grows is actually 'young' sandstone, sometimes a hard peat. You can easily crumple it to wet dust or mud in your hand. Pass after pass, year after year, decade after decade; closer & closer to the "Hang" where no gear could tow - - - and then eventually defeating even that with rock-hopper gear: NOAA sees no need to investigate nearshore habitat loss. They will continue to restore squirrels in a vast wheat-field with only hunting controls.. Combined weight of habitat loss & overfishing finally overpowering sea bass's production ability, the true depths of sea bass overfishing were begun. In 1997, management now begun & using a tool they still do not know they possess, regulation began to reverse overfishing by exploiting sea bass's natural inclination to spawn, even sometimes at age zero in southern waters - but only if no larger sea bass are about. Now it appears as though the skippers who predicted management would destroy our fishery will end up being the wise ones. There's not a lot of time left. Management has completely undone their earlier population gains. They've also driven many for-hire businesses over the edge. Raising the size limit so management is again protecting most of the new, modern spawning class may work as it has in Southern New England. A 13.5 or 14 inch size limit may reinstate some of our lost production. 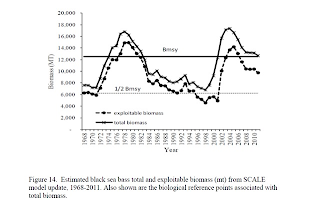 Trawl discards that even made commercial skippers sick in Feb/Mar 2004; The imaginary recreational discard mortality that prevented reopening sea bass in Jan/Feb 2015 - A constant and forever statistical hallucination telling managers every kind of information except true: Those are not what hold back the sea bass recovery. Bycatch & Discards, Overfishing, Climate Change - These Are Not The Issue. Though real, they are as nothing compared to those 28,000,000 million New Jersey sea bass that weren't spawned. That absent population is joined-again by millions more in coastal calculation. They would be joined by millions more still had their spawning production been realized. Management leans against the convenient assumption climate change has caused population shift. Management has seized our fishery & all its potential production by regulation owing only to statistics no one should believe. What a fabulous squandering of a renewable resource. There can be no greater waste of surplus production than regulations which ensure no surplus occurs. Were habitat's importance recognized and acted upon for this reef dwelling species years ago--and management's ability to utilize age at maturity as a tool for restoration been recognized aa well, we'd be trillions of sea bass ahead. Instead we're 10,000 MTs behind. Recreational fishers in outboard boats are getting the blame for it. Hey management! If your estimating system is too lazy to account professional VTR reported catch in their recreational estimates, then they're too lazy to bother testing for accuracy in any other estimate. Every single time sea bass regulations have tightened it was because of bad estimates, not actual overfishing. Since 2001 each additional regulatory tightening, stemming again from bad estimates, has resulted in a further decline in spawning production. ..unless we read NOAA press releases. Sure are pretty ..but I can't cook a press release. They won't pay a bill, won't replace my 2001 truck..
Marine Fisheries Management & Restoration is a young science. By shifting management's focus away from data that resists all repair, and turning their efforts instead to methods of increasing production, we may yet again see benefit from our regulatory pain. It will be too late for some businesses. It's certainly not too late for the fish.